OK, this wedding may have been small (only about 25 people), but it was a pretty big deal for me. It was my sister's wedding. She married my (new) brother-in-law on April 5th, which was our mom's birthday. It was a really simple but elegant wedding held at Arizona's Boyce Thompson Arboretum. The bride and groom didn't want to have a ton of flowers and decorations since nature did such a good job providing the colors, so Darcie just had a simple bouquet of white lilies. 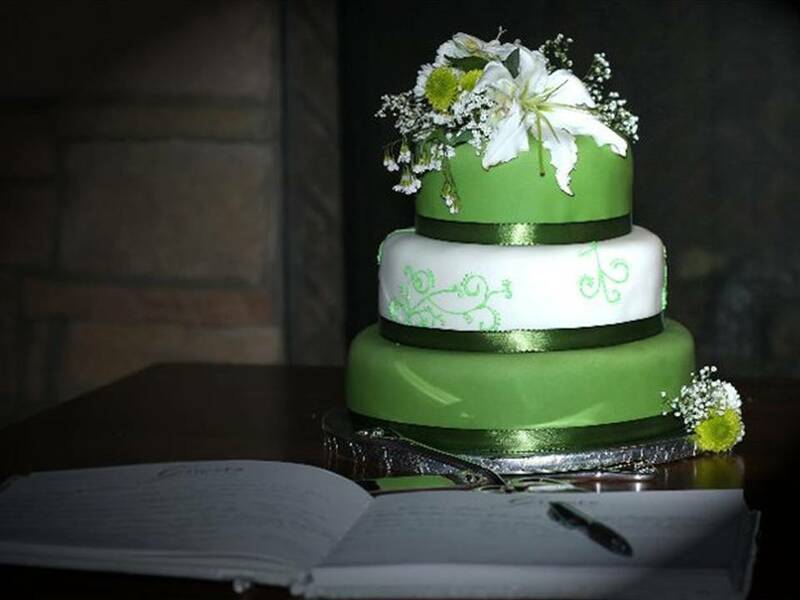 She wanted the cake to reflect that simplicity too. So, we stuck with something simple, which was good since I was making the cake at my parent's house in AZ and didn't want to take a bunch of equipment on my trip. The bottom and top tiers were left without any decoration except a simple ribbon, and the middle tier had a nice filigree pattern that my Aunt Jann helped me make. A few fresh flowers are the finishing touch. They weren't sure of the cake flavor and fluctuated between traditional vanilla and something different, so we did both. Darcie really wanted a flavor that Rick would like, but he's not really a cake fan. He did, however, recently try a chocolate cake that he liked, and said that he liked it because it was not too sweet. Rick is also a pretty big beer fan. Well, naturally I recommended the Guinness chocolate cake recipe that's been such a big hit in the past. 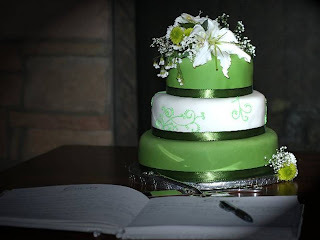 So, the green tiers were the Guinness cake with vanilla buttercream, and the middle tier was traditional vanilla with vanilla buttercream. Darcie and Rick trying to figure out how to cut the cake. Rick wanted to keep the top tier, but there was still plenty of cake to go around. The waiters at the restaurant were a little nervous about cutting the cake, so they asked that I do it. That was how I discovered that I am a more talented cake baker than I am a cake cutter, but oh well. Everyone got at least one slice, and there was still some left for the restaurant's waiters that did such a great job. All-in-all, it was a really good day, and everything went very smoothly. Congrats again, guys!